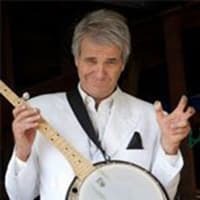 Steve Martin Celebrity Look Alike Impersonator Looks-Voice and even plays live Banjo The first time he ever heard the words, “Has anyone ever told you that you look like Steve Martin?” he was 12! Gray hair aside, this comparision has followed Adam through out his life as a comedian, actor, musician, and even as a waiter at Wolfgang Puck’s Spago and the Ivy.This doppelganger effect led him to pursue a career as a stand up comic in LA, performing his own material, where he had the good fortune of opening for Drew Carey at the Improv in Hollywood. As an upright bassist for over 20 years Adam has played with some of the giants of Americana: Dave Alvin, Lucinda Williams, Carlos Guitarlos, Phil Alvin, Top Jimmy, Bill Bateman, Joe Ely, James Intveld,Brantley Kearns, Gene Taylor, Lavay Smith, and many more. Invite Steve Martin Celebrity Lookalike Impersonator to your next event. He will even bring his banjo to entertain you and all of your guests. He has a great Steve Martin Look Alike look and has never disappointed. He is very funny and is quick with his humor. He has all they typical Steve Martin props.